Presented in this informative text is a concise, clear picture of the fingernail, its anatomy, what affects its health, how to combat weak nail problems, how to obtain strong, healthy nails and what products to buy. At the bottom of this page is a list of 19 books-only one copy each. They are from my late maestro's library. Byron Pang 1935-2009 was my teacher from December 1979-February 1981. 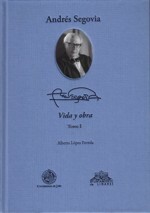 He was a student of José Rey de la Torre from 1966-1970.
by López Poveda, Alberto 2 Hardcover volumes in Spanish language only $199.95, shipping weight 6.5 lbs. by (por) Richard “Rico” Stover. 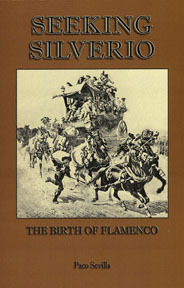 436 pages (paginas) $49.95. 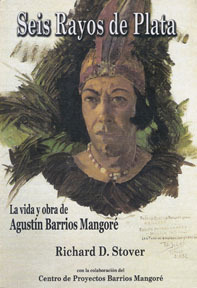 Spanish language edition (edicion en Español-publicada en Paraguay May 2, 2010) of “Six Silver Moonbeams-The Life and Times of Agustin Barrios Mangoré”. 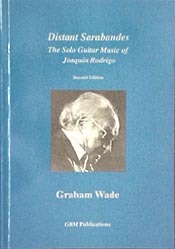 There are commentaries by Leo Brouwer, Abel Carlevaro, Sila Godoy and John Williams; new works including a transcription of "Bicho Feo". 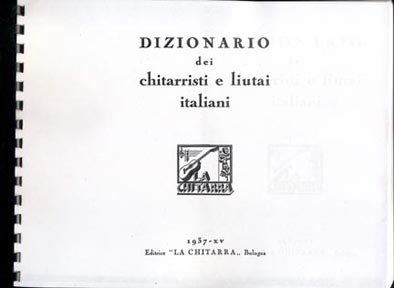 Dictionary of Italian Guitarists and Luthiers (Text in Italian) published in 1937 by Editrice "La Chitarra", Bologna 305 pages $39.95. 8 1/2" by 11" ships as 3 pounds. 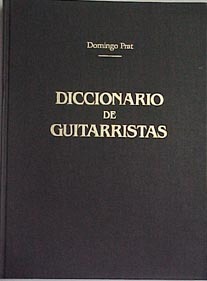 Index of the Diccionario de Guitarristas by Domingo Prat 104 pp. 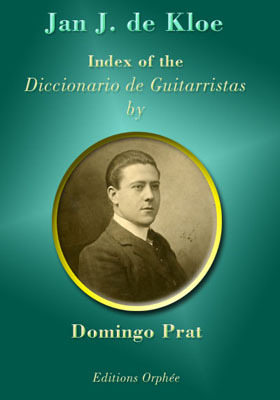 $29.95 Compiled by Jan de Kloe With his Diccionario de Guitarristas, Domingo Prat provided us in 1934 with a wealth of information on the guitar and related subjects. 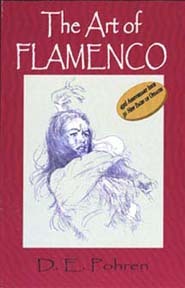 The Art of Flamenco by D. Pohren $36.95 First published in the '60's, it is known more or less as the bible of Flamenco in English. It covers the song styles with lyrics and translation, dancing, singing, guitar playing. It has places to study dance, song and guitar in Spain. Available once again 7 /27/ 05. 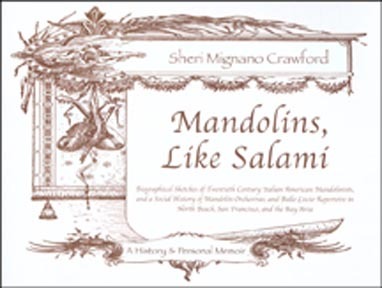 This landmark historical text delivers the goods promised in its title. 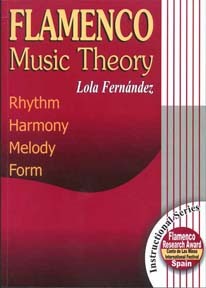 It does not address flamenco dance whatsoever, focusing instead on flamenco song forms with a special chapter devoted to the role of the guitar. 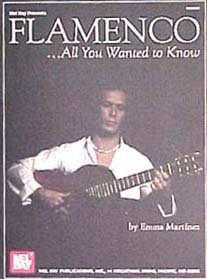 by Lola Fernandez 136 pages $39.95 Flamenco is not just about music, but it is, above all else, music. 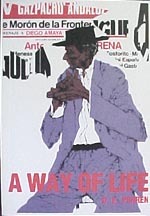 A Way of Life by Donn Pohren 198 pages-14 w/ B&W photos $ 27.95 paperback Back in Print. Donn Pohren let's you in on what it was like in Spain, before the changing of time. This contains a whole lot about the daily life of Diego del Gastor. Paco de Lucia and family "The Master Plan" by D. Pohren $37.50 This book has Paco's biography, discography & photos from the early days w/ Jose Greco etc. 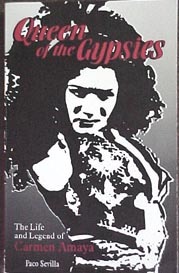 Lives & Legends by D. Pohren Hardbound $39.95 This tome contains the complete listing of biographies of singers, dancers & guitarists from the 19th century until now. Out of print, hopefully available in 2002. The Wind Cried by Paul Hecht $29.95 Hardbound The story of an American who went to Malaga in '57 and couldn't stay away. He discusses Fosforito, Pedro Bacan, La Nina de Los Peines, and all the flamencos at the Peña Juan Breva. The Flamencos of Cadiz Bay by Gerald Howson $29.95 Hardbound This book recalls the experiences of a lad from England who went to Cadiz, Spain in 1954.
by Graham Wade $39.95 232 pages Softcover This is the first book to present a detailed account of the musical achievements of Julian Bream. 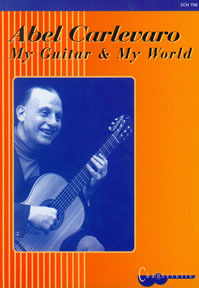 Abel Carlevaro: My Guitar and My World 96 pages $13.00 Compiled and translated by Patrick Zeoli.Writings and reminiscences on various aspects of the Maestro's life's-work with the guitar. 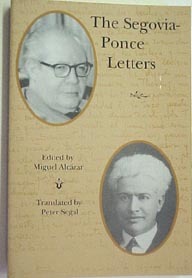 Includes chapters on Segovia, Villa-Lobos and Agustín Barrios. 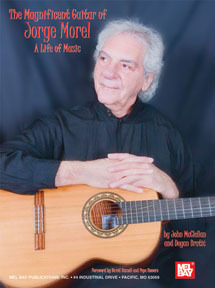 The Magnificent Guitar of Jorge Morel A Life of Music 238 pages $29.95 This book is the story of love, life and loss told by the legendary Argentinean guitarists, Jorge Morel. 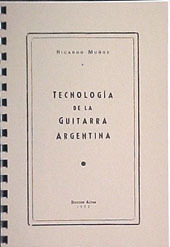 The Guitar of Andrés Segovia CD and package $44.95 History, sound and photographs of his 1937 Hauser guitar.Texts: English, French, German, Italian; Texts and technical drawings by Richard E. Bruné Photos in high resolution by courtesy of The Metropolitan Museum of Arts. Books: One Only THIS PAGE HAS SPANISH LANGUAGE COLLECTABLE USED BOOKS AND MAGAZINES, THAT ARE NOT EASY TO FIND IN NORTH AMERICA. They are from Spain and Argentina. 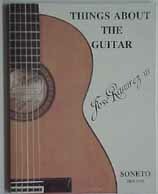 Classical Guitar Answer Book by Sharon Isbin 84 pgs. 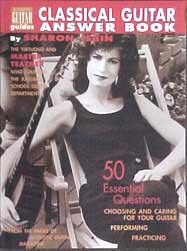 $14.95 This book is a compilation of 50 questions over a variety of subjects that originally appeared in the Acoustic Guitar Magazine. 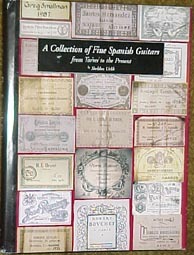 In the section "Salons and Shops Specializing in Classical Guitars", Fine Fretted String Instruments is listed along with 19 other stores-some now out of business since the book's publication. 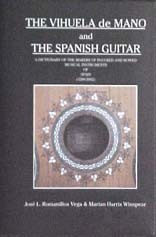 The Vihuela de Mano and The Spanish Guitar: A Dictionary of the makers of plucked and bowed Musical Instruments by José Romanillos Vega and Marian Harris Winspear. 654 pages with 28 appendixes. Hardbound $199.95. 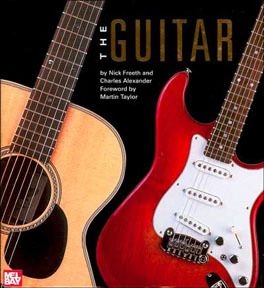 The Guitar by Nick Freeth, Charles Alexander, with the foreword by Martin Taylor 320 pages Hardcover. $35.00 This book weighs 4 lbs. even and ships as 5 lbs. 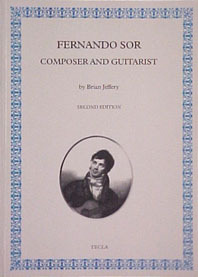 Fernando Sor Composer And Guitarist biography 2nd edition paperback only 199 pages, 17 illustrations, $48.95 by Dr. Brian Jeffery Fernando Sor, born in Barcelona in 1778-died in Paris 1839, is without a doubt, the most influential and magnificent guitar composer of modern times. 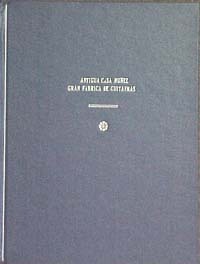 1931 Antigua Casa Nuñez Catalog "Nuevo Catalogo de Metodos y Obras Musicales". 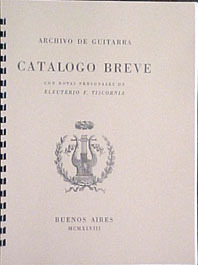 Eleuterio Tiscornia Catalogo de su Archivo de Guitarra 1897-1945 94 pages, 9 photos & illustrations (Guitar Method covers) $60.00 oversize softbound edition (Catalog of his Guitar Archive 1897-1945). Spanish language edition $19.95, 3rd edition with 32 pages softcover with English translation addendum by Randy Osborne $24.95. 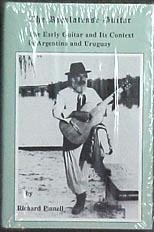 The famous Argentine guitarist and singer, Atahualpa Yupanqui, said of Fleury's tone: "No one has outdone his tone yet." 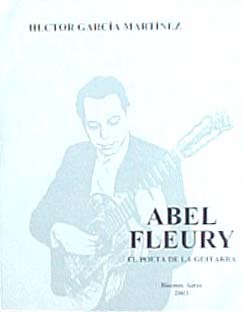 Abel Fleury owned two guitars built by Francisco Simplicio. 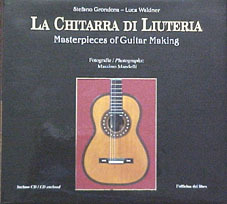 One of these can be seen in this book: La Chitarra di Liuteria. Philip J. 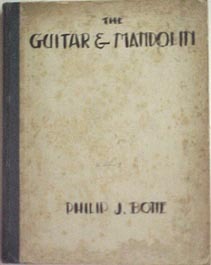 Bone Manuscript to "The Guitar & Mandolin" 1st edition. This was first published in 1914. This is the double spaced typed manuscript with the musical examples pasted in, or in envelopes, that was taken to Schott & Co. Ltd. in London to be published. 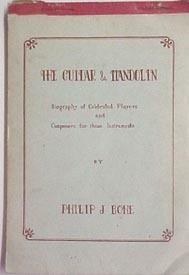 It is a two volume bound manuscript. $6,000. 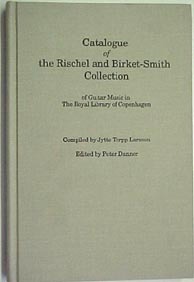 Catalogue of the Rischel & Birket-Smith Collection of Guitar Music in The Royal Library of Copenhagen Compiled by Jytte Torpp Larsson and edited by Peter Danner Hardbound 263 pages $44.95 Have you ever wondered who were the 1st edition publishers for the classical guitar virtuosos of the 19th century? 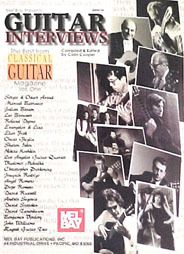 Mauro Guiliani - Virtuoso guitarist & composer by Thomas F. Heck $44.95 paperbound The most authoritative work on this major contributor to the 19th century classical guitar repertoire. 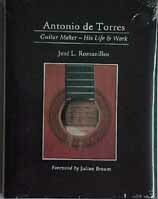 Antonio de Torres Revised Edition 1997 by Jose Romanillos-Softcover $64.95. 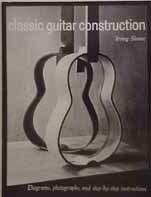 The long awaited for update that includes at least 20 new guitars added to the catalog and new research information.The hardcover edition is now out of print. 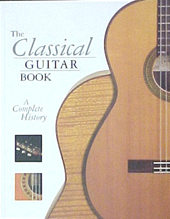 The Classical Guitar - a complete history featuring the Russell Cleveland collection. 126 pages, 100's of photos, label closeups, fold out pages , limited edition (6000), slip cover case. Out of Print. A softcover edition is now available @ $39.95. 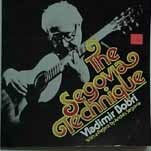 The Segovia Technique by V. Bobri $21.95 softbound This book of photos of the technique of the Master was first published in the early '70's in hardback. 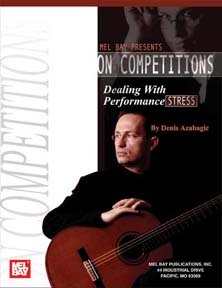 Published almost 25 years ago, I bought this when I first got interested in Classical Guitar, it covers the subject of playing well completely and is therefore still in print. 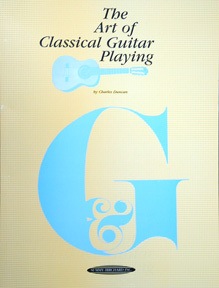 For the companion volume see Classical Guitar 2000. The Steve Howe Collection This is permanently out of print. 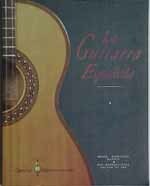 Manuel Ponce & The Guitar by Corazon Otero $29.95 Softbound only 8 / 9 /05. 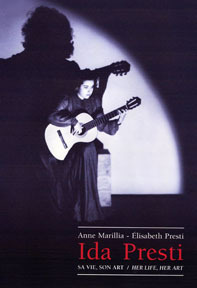 The Guitar from Renaissance to the Present Day by H. Turnbull $29.95 softbound First published in '74 this book covers from the days of the vihuela (4 course) to the adaptation of the 6th string in the first decade of the 19th century to the 20th century achievements of Andres Segovia. 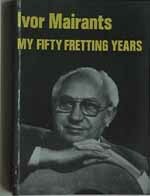 My 50 Fretting Years by Ivor Mairants $19.95 This book covers his experiences from c.1929-1979 when it was first published. 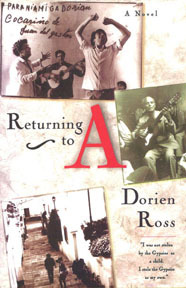 It has Classical, Flamenco and Jazz artists that Ivor met in his travels. 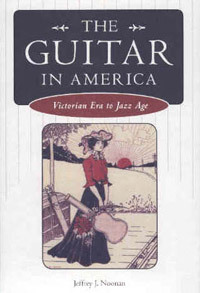 Sophocles Papas by Elizabeth Papas Smith $18.95 This biography of the legendary Washington D.C. guitar teacher and music publisher is so fascinating I read it in one day. 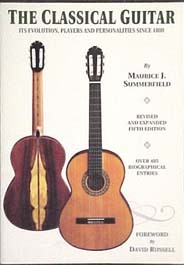 The Classical Guitar 5th edition by Maurice Summerfield $39.95 This book covers 19th and 20th century players, composers, guitarmakers, scholars, and has a Flamenco section as well. Fine Fretted String Instruments has received an unsolicited acknowledgement and is listed on page 364 under Sources of Information and Supply. Six Silver Moonbeams by Richard Stover $29.95. 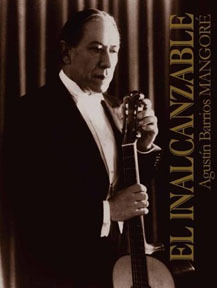 The most authoritative biography of the 1st classical guitar player to make phonograph records-Agustin Barrios Mangore. 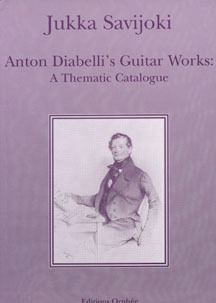 271 pages -contains discography, list of manuscripts, photos, and the guitars the Maestro used throughout his illustrious career. 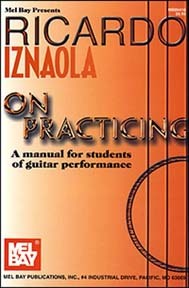 New revised edition by GSP of the 1992 edition with new information. 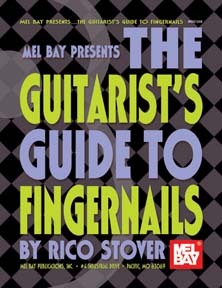 by (por) Richard “Rico” Stover. 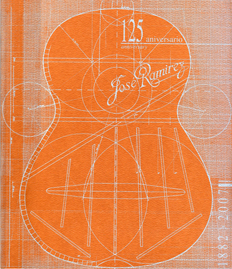 436 pages (paginas) $49.95. 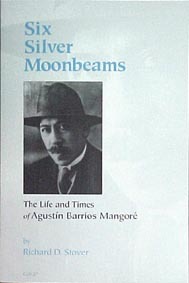 Spanish language edition (edicion en Español-publicada en Paraguay) of “Six Silver Moonbeams-The Life and Times of Agustin Barrios Mangoré”. 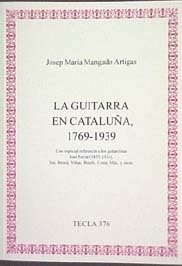 There are commentaries by Leo Brouwer, Abel Carlevaro, Sila Godoy and John Williams; new works including a transcription of "Bicho Feo". Published in May of 2010. 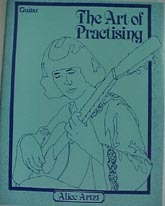 The Art of Practicing by Alice Artzt $17.95 A helpful book on technical progress and how to get the most out of today's guitar by someone with over 25 years recording experience. 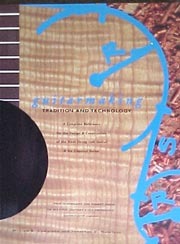 Guitarmaking-Tradition & Technology by William R. Cumpiano & Jonathan D. Natelson Softbound 386 pages-w/ 100's of photos & illustrations. $49.95. 1. The Segovia Technique by V. Bobri $99.95 Hardbound This book of photos of the technique of the Master was published in 1972. 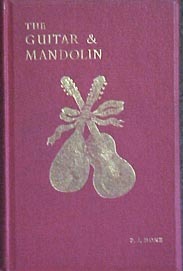 Dust Jacket with a couple of tears, book in mint minus condition.